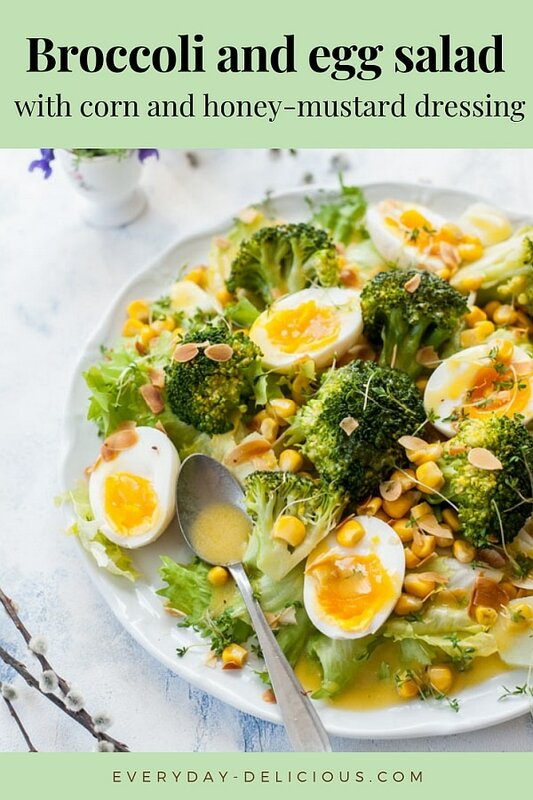 Egg, broccoli and sweet corn are the perfect combination. 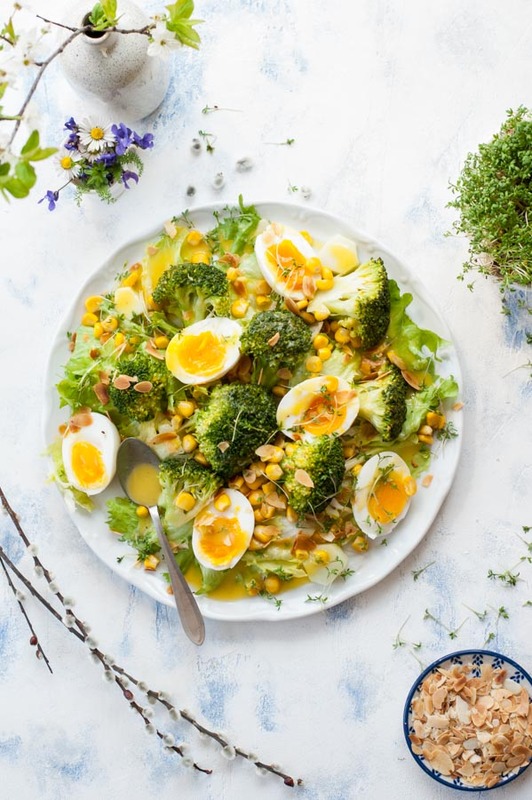 Slightly runny egg yolk, crunchy broccoli, lettuce, and sweet corn are tossed with creamy honey-mustard dressing and sprinkled with crunchy toasted flaked almonds and peppery garden cress. 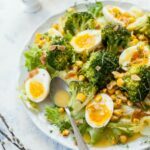 This broccoli egg salad is seriously addicting! 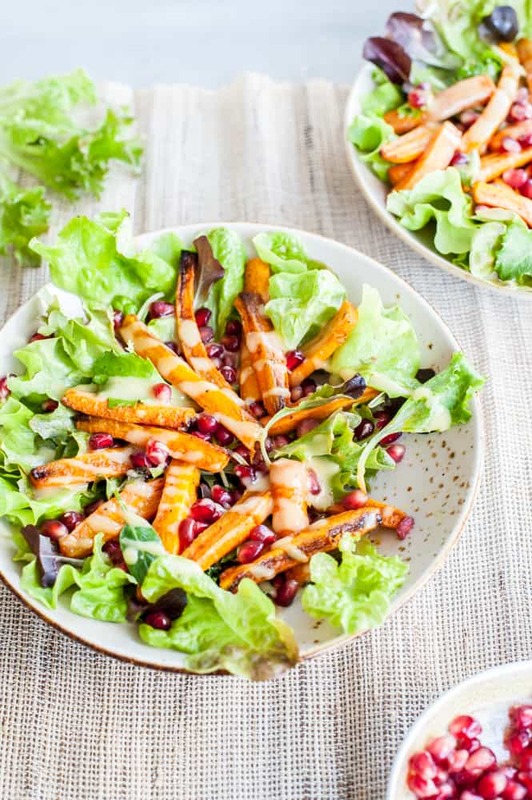 When spring arrives, I always think about this salad. Maybe because of its colors? 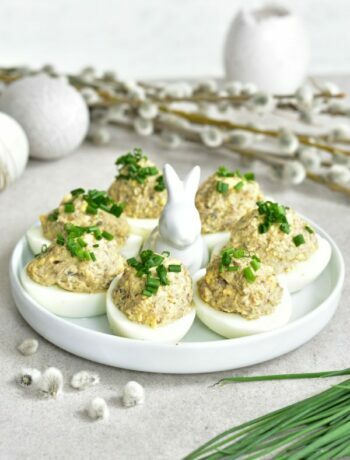 I often serve it at my Easter table, everyone loves it! You can boil / steam the broccoli, cook the eggs, prepare the sauce and toast the almonds. Just before serving: wash and spin dry the lettuce and garden cress, combine all the salad ingredients, vigorously shake the jar with the dressing and pour over the salad. – better way: you can toast them in the oven, flaked almonds toasted that way are more uniformly browned and just taste much better! You can toast more almonds and store them in a tighly-closed jar and sprinkle on salads and desserts. How to toast flaked almonds in the oven: preheat the oven to 180 °C / 350 °F / Gas Mark 4, spread the almonds in a single layer on baking tray lined with parchment paper, bake for 5-7 minutes, until golden (keep an eye on them, they can easily burn), immediately transfer on a plate. Egg, broccoli and sweet corn are the perfect combination. 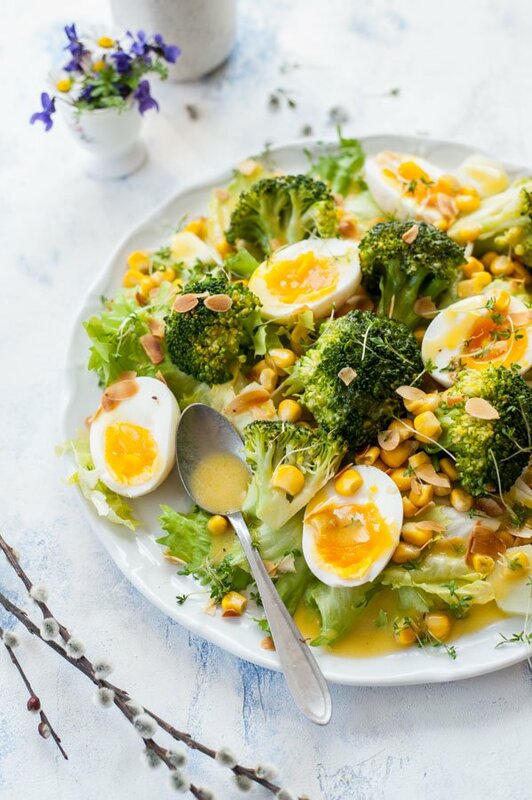 Slightly runny egg yolk, crunchy broccoli, lettuce, and sweet corn are tossed with creamy honey-mustard dressing and sprinkled with crunchy toasted flaked almonds and peppery garden cress. Rinse the lettuce, tear into smaller pieces, spin dry in a salad spinner (if you have one). Place the eggs in boiling water, cook for 6-7 minutes, since the moment it starts boiling. Transfer the egg to very cold / ice water, peel them and cut in half. Toast flaked almonds on a dry pan until golden, transfer them immediately on a plate (so that they do not burn). Pour all the dressing ingredients into a small jar, season with salt and pepper, cover the lid and shake vigorously, the dressing should be thick and creamy. 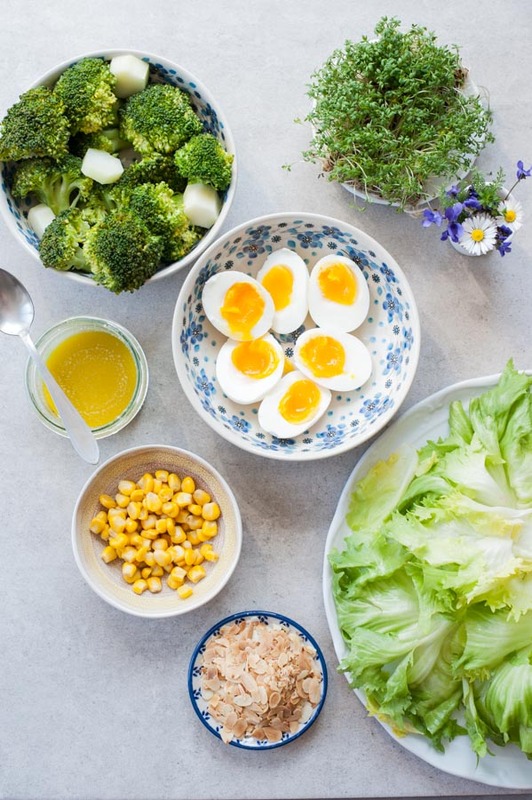 Spread the lettuce on the plates, then top with broccoli florets, egg halves, and corn. Season with salt and pepper, pour over the dressing, sprinkle with almond flakes and garden cress. – or in the oven: preheat the oven to 180 °C / 350 °F / Gas Mark 4, spread the almonds in a single layer on baking tray lined with parchment paper, bake for 5-7 minutes, until golden (keep an eye on them, they can easily burn), immediately transfer them on a plate. Make ahead: You can boil/steam the broccoli, cook the eggs, prepare the sauce and toast the almonds. Calories count = 1 serving (½ recipe). Did you make this recipe? Let me know how you liked it and give it a star rating in the comments below! You can also add a photo of your creation! Hi! I‘m Aleksandra. I believe you should eat delicious food every day! I create quick, simple and sometimes fancy recipes with easy to follow descriptions and step-by-step photos, that every home cook can make. Find out more about me.